I watched a television programme in which Alan Titchmarsh, the presenter, was made up to look like a Neanderthal man. Afterward, dressed in normal clothes, he walked through central London and barely received a second glance. This gave me the idea that people who were not quite human could be living among us unnoticed. Seeing some of the customers at a video store made the idea seem feasible. I wanted to explore what might happen in a seemingly ordinary town if this were so. 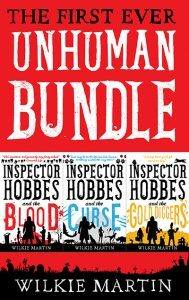 Inspector Hobbes came from the idea that ‘unhuman’ beings lived among us. I made him a policeman after noticing how people often see a cop but don’t see the individual behind the uniform or badge, which struck me as an excellent place for an ‘unhuman’ to hide. The character was an amalgam of various people, such as my grandfather and teachers who I’d liked but who I’d also found to be a little scary when I was a boy. Since Hobbes was ‘unhuman’, I struggled to get inside his head and to know his thought processes. I tried a third person point of view but found the character was too distant. The way out of this was to use a narrator who I could understand, and who could report on Hobbes’s actions—in a similar way to Dr Watson narrated the Sherlock Holmes stories. This narrator became Andy Caplet, and his misadventures and failings became an important part of the book. Sticking with the Sherlock Holmes theme, I gave Hobbes a housekeeper, Mrs Goodfellow, who is one of the few to understand Hobbes and to know something of his history. Dregs, the big bad dog, just walked into the story and wouldn’t go away.